FBTBForums.net :: View topic - How about displaying minfigs? 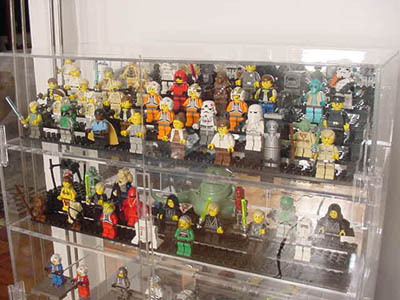 Posted: Wed Mar 09, 2005 2:03 pm Post subject: How about displaying minfigs? ...with a 2x8 black plate in each cubicle for the minifigs to stand on, and just have a few up at a time. But what about larger displays? Anyone have interesting solutions for showing off your 'fig collection? I'm thinking mostly wall units, be it made of LEGO or not (as per the link above). those are kind of costly to display an handful of figs no? you can make individual little lego cases(someone got the link?) but they end up costing even more in the end. this is the one i have. its works nice and keeps the dust out....the pic is really really old. I didn't get it just for that: I had it lying around and started using it as such, but I'm looking for something... bigger... now. seriously, you can probably make a small(or big) custom glass display case(w/shelves) for very little money...probably $100 or less. if you want to be really cheap, you can hit up home depo(any store of the like) and make one out of lucite(acrylic) for next to nothing probably $50 or less. Where did you get that case? i got it for free. i was walking by a store that was going out of business and i asked the guy how much he wanted for it? he said take it, so i did. seriously, it would probably cost you less money to make it yourself, its a total joke to put this thing together. all you need is to measure out the specs for how big you want it to be, the number of shelves you need, go to home depo, have them cut the pieces of lucite/acrylic for you(its free), get some epoxy and glue it together. now finding the hinges for the doors is the tough part but i'm almost positive they'll have some available in home depo. theres also a lock on mine but thats a silly feature no one really needs. if anything, ask about the hinges before getting started with anything else. use all ur FD II's and make a big wall, waaay cheaper. "Mini-fig Display Case by onions"
Nah that's good for individual pieces, but the cost of doing that for the amount of thinking would be way too prohibitive. I think dnd's original idea is the best, now that I can see the image-- for some reason it wasn't displaying til now. You could probably find the same thing at your local Bed, Bath & Beyond or Linens n' Things. Just need to find a clear box to contain it and there you go.